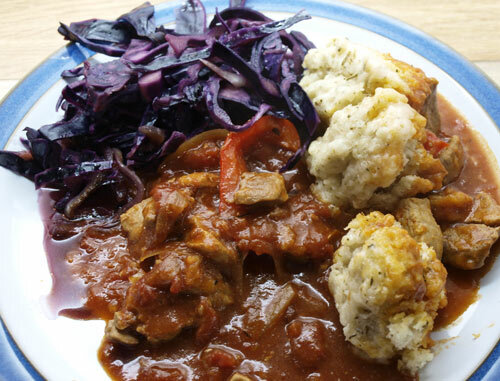 On these cold winter's days, you need something warming and substantial for your dinner, so when I saw this Pork Goulash with Dumplings in BBC Good Food Magazine, I thought it would be just the thing. 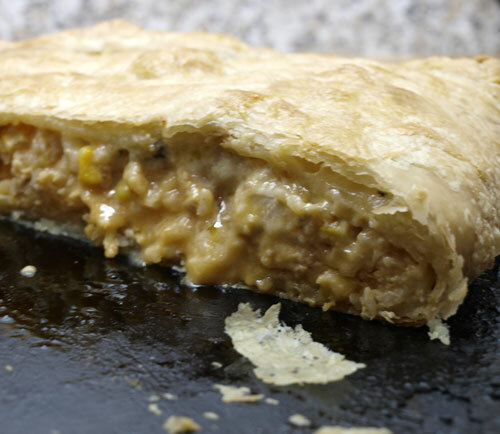 It also allowed me to use up some vegetarian suet I had in the cupboard and a chance to use the smoked paprika my son bought me for Christmas. 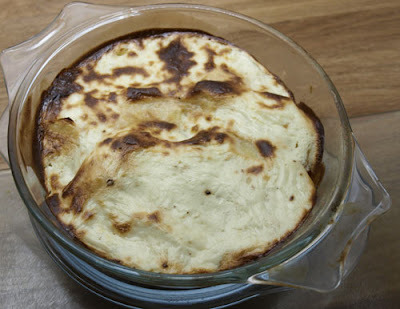 It was very good and very easy to make. Having the dumplings meant there was no need for potatoes or rice and I served it with braised red cabbage loosely based on Nigella's recipe in Feast. 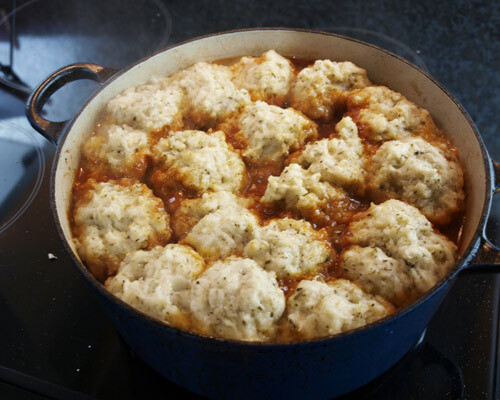 You will note that their dumplings are much smaller and a neater than mine, but I expect they tasted much the same! 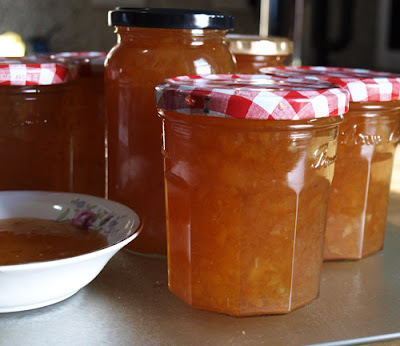 It's been some time since I made marmalade, two or three years at least. I used to make it every year and in bigger quantities than this too. 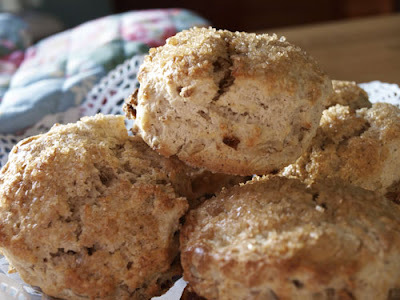 However, I just fancied making some and got a bag of seville oranges and a lemon, some sugar and I was ready. I've been using the same recipe since the early 1980s, it comes from 'Home and Freezer Digest' magazine which was one of the few foodie mags available in the UK at that time. 1. Wipe and cut the oranges in half, squeeze out juice and pips. 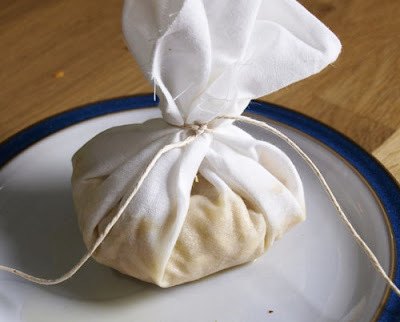 Put pips in a muslin or stockinette bag and tie. Put orange juice in pan with water and lemon juice. 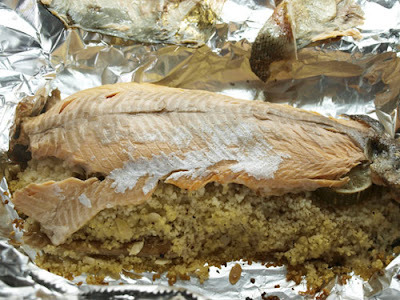 Now the recipe differs slightly from what I do next, life is too short to slice up all that peel. 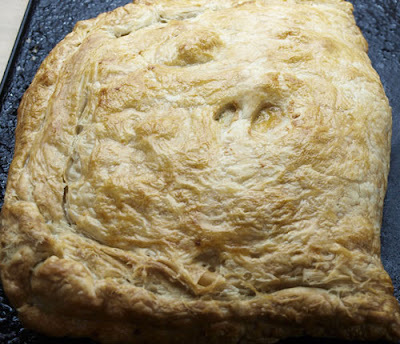 My mum used to put her's through a mincer (hand turned as well!) but I use the food processor. 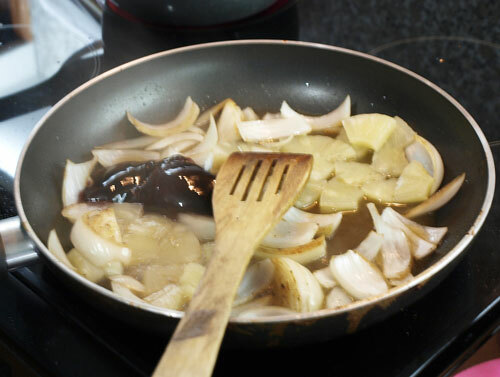 Slice peel thinly and add to pan with pips. 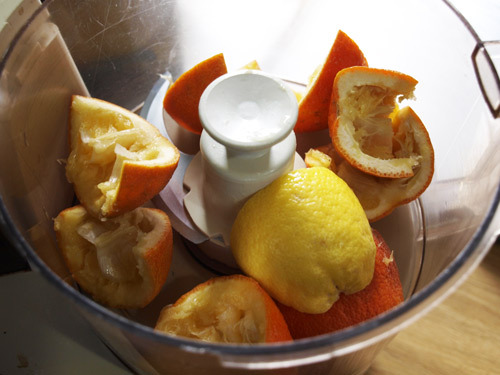 Chop peel into chunks and whizz in the food processor. 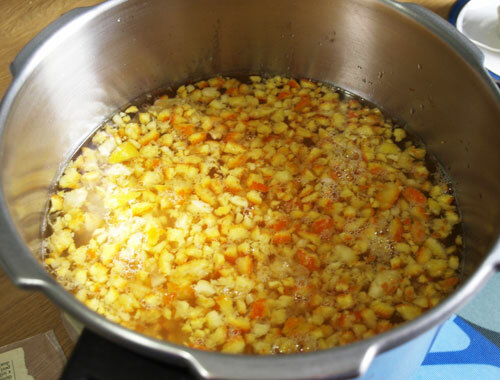 Simmer about one and a half hours until peel is soft and liquid reduced by half. 4. Take out bag of pips and squeeze out any liquid into pan. Stir in sugar over low heat until dissolved. Boil rapidly to seeting point (generally I give it at least 30 minutes rapid boiling before I start to test for set). 5. 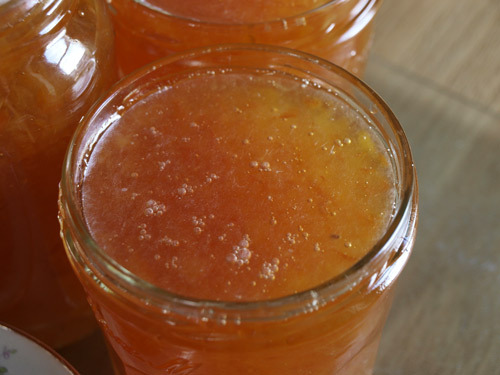 Cool for about 10 minutes in pan, stir well, pour into warm, clean jars, cover seal and label. Store in a cool, dry place. So why, I hear you ask, is it Exploding Marmalade? Remember I said, it had been a while since I made it? 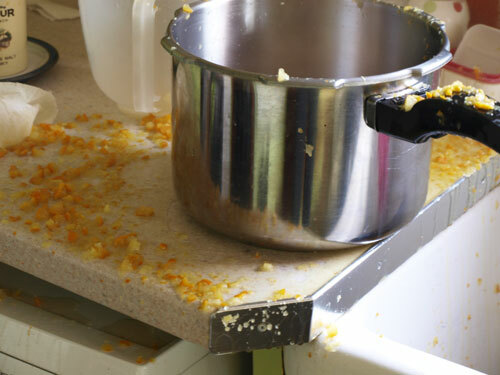 Well, I really thought that I had previously cooked the chopped up peel in the pressure cooker under pressure, so that's what I did. The peel must have risen up and blocked the steam valve, because even when I thought I'd got all the steam out, I hadn't so when I opened the handle, there was a minor explosion! Oh yes, and all over the floor too! However you will have gathered that I didn't lose it all, there was still enough left in the pan to make 6lb of marmalade, it just doesn't have quite as much peel in it as usual! 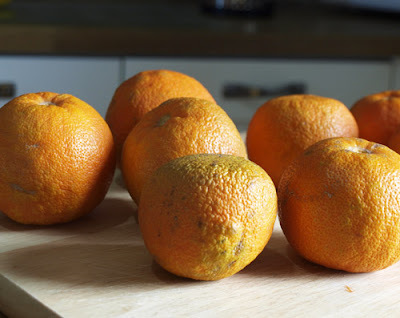 PS I later realised that the recipe that I had previously made in the pressure cooker is one which uses whole frozen seville oranges and you chop them up afterwards - doh! 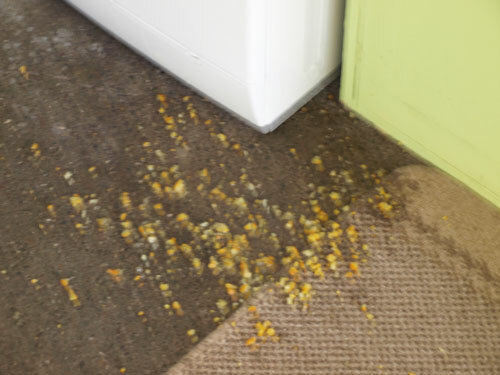 PPS I didn't get covered in any of this, I opened it at arms length as I could hear that it wasn't happy, and it didn't really take that long to clean up, the house smelled of oranges all day! 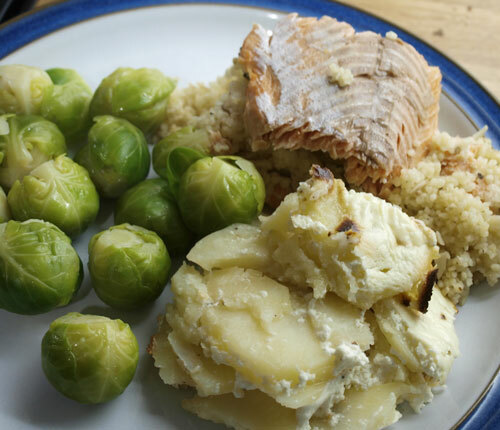 I'm a member of the UK Food Bloggers Association (UKFB) and I host the 'I've Blogged' group, which allows Food Bloggers to let other members know when they have blogged a new recipe or food related post on their blog. We recently made 100 members and I had a giveaway of a River Cottage Diary. 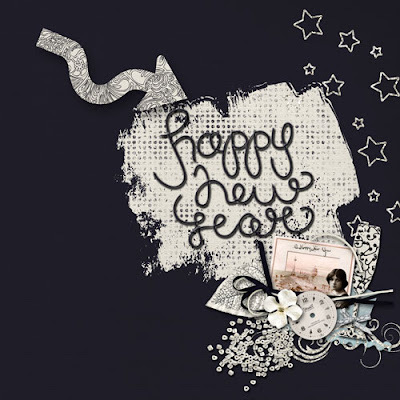 However, as it was over the holiday period only two bloggers signed up to win the diary. In the end I sent one to each of them, congratulations to Choclette and The Kitchen Maid. 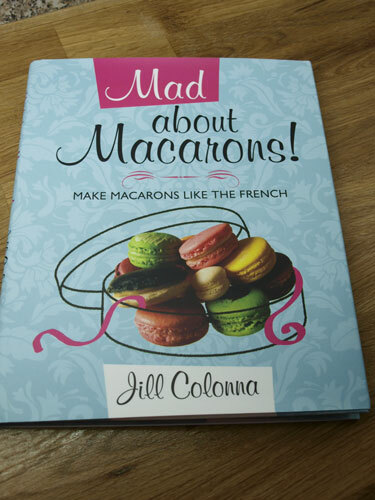 However, after the giveaway was closed I was contacted by Jill Colonna, another member of UKFB who has written an amazing book 'Mad about Macarons' and Jill kindly offered me a copy of her book to give away on my UKFB group. What is so amazing about this book is the detail that Jill goes into to help you make the perfect Macaron. There are all kinds of different versions in a variety of colours. 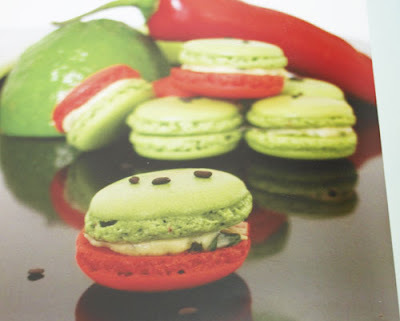 and the book even includes recipes for savoury Macarons, like Thai Green Curry Macarons. 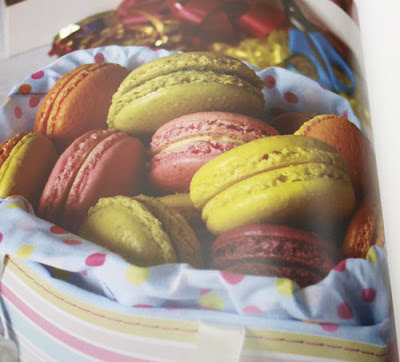 Jill has even thought of including some recipes for what to do with the egg yolks that are left when you have made your macrons! If you would like to take part in the giveway, come on over and join the 'I've Blogged' group at UKFB. 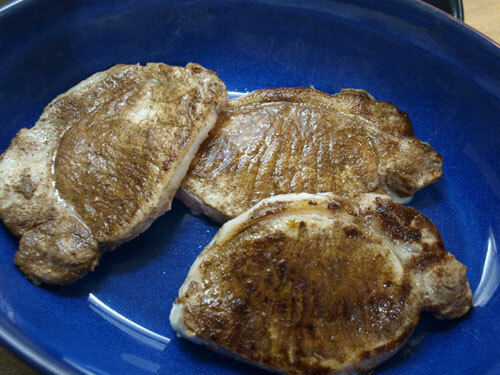 I made this Fruity Pork Steak recipe from BBC Good Food for supper tonight. It was very tasty, but I was really disappointed in the pork steak itself, it was seriously tough, which rather spoiled the delicious sauce. 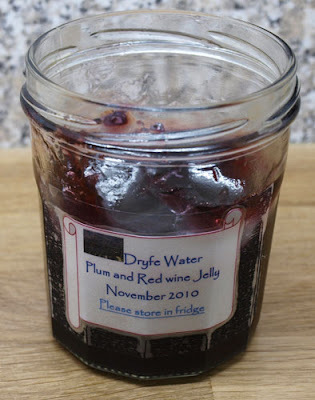 I made the alternative version with pineapple instead of apple I also used some of my SIL's Plum and Wine Jelly rather than redcurrant jelly. 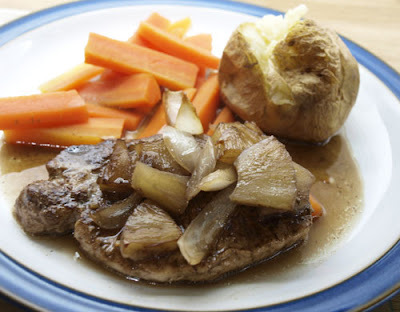 I think I would use pork fillet next time and I'm not sure I would bother with the chicken stock, to intensify the flavours of the sauce. A new website is launching today that aims to revolutionise the way people use cookbooks. whatsinmycookbooks.com is a free online tool that makes the link between digital search and real-life books. 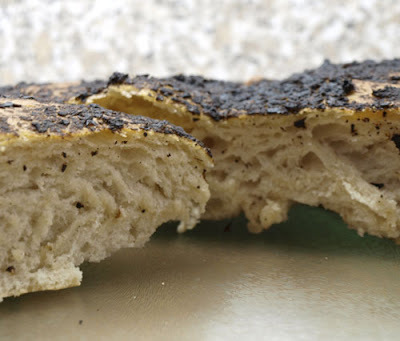 It shows users exactly where to find ingredients and recipes in their OWN cookbooks, helping them make the most of the books they already have in their bookshelves. A powerful search tool, whatsinmycookbooks.com lets users search by dish name, dish type or up to five individual ingredients. It has details on the book and page numbers for over 28,000 recipes in its online library, and what ALL of the ingredients are in every one. Registered users can select a personalised ‘bookshelf’ to tailor the results of the search to the cookbooks they already own. 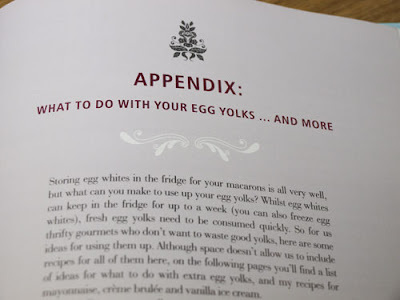 The whatsinmycookbooks.com library is constantly growing, with a view to having every cookbook published in the last 5 years in the database by the end of 2011. 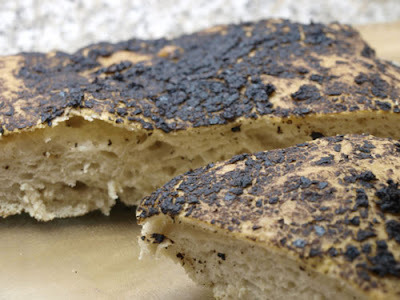 They are currently looking for suggestions for cookbooks to include in the site, so get over to What's in my cookbook.com register and make some suggestions.